The current international trade regime backed by the World Trade Organization (WTO) is harming small-scale farmers in the least developing countries (LDCs), significantly increasing their risk of food insecurity and reliance on large-scale producers, an independent United Nations human rights expert warned today. 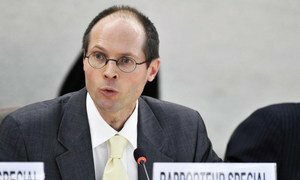 Mr. De Schutter stressed that the international trade regime must acknowledge the dangers for poor countries in relying excessively on trade, as this exposes them to volatile grain prices, which can quickly change their landscape into one of poverty and hunger, felt by urban and rural consumer alike. “The food bills of LDCs increased five- or six-fold between 1992 and 2008. Imports now account for around 25 per cent of their current food consumption. These countries are caught in a vicious cycle. The more they are told to rely on trade, the less they invest in domestic agriculture. And the less they support their own farmers, the more they have to rely on trade,” he said. Mr. De Schutter emphasized that it is this trade-centric approach – strongly championed by the WTO – that is limiting the ability of LDCs to ensure their food security. “We miss the simplest of win-wins. If we were to support developing world small-holders, who are often the poorest groups, we could enable them to move out of poverty, and enable local food production to meet local needs,” he said. Far from benefiting from the opportunities provided by access to international markets, LDCs are “victims of the pressure on land, water, and natural resources on which they depend, for which they increasingly have to compete with the agro-export sector,” Mr. De Schutter added. Mr. De Schutter called on the WTO to take these factors into account and ensure compatibility with the food security agenda to prevent vulnerable populations from experiencing endemic poverty and hunger. The right to adequate food must be at the top of the agenda of next month's global trade talks, an independent United Nations expert stressed today, calling for bold policies to ensure food security.